Muslim UB students are taking this week to break stereotypes. There are more than 200 students in MSA and members felt Islamic Awareness Week is more important now than ever. The current political climate and President Donald Trump’s travel ban executive order has influenced the club’s events this week. The Spectrum was unable to get a total number of Muslim students at UB, but there are 122 students from Iran, Iraq, Libya, Somalia, Sudan, Syria and Yemen. “In essence, most of the events look at the diversity within our campus; whether that be interfaith, intercultural, or even just on a person-to-person basis, and events focus to talk about Islam in a way that isn't regarded as taboo or seen as different,” Islam said. Islam said many MSA members feel their religion is misrepresented and it is linked to terrorism. On Monday, MSA held a student panel in Baldy 101 encouraging students to explore different faiths. "Islam is the most diverse religion in terms of geography and ethnicity, so it was important to us to address this quality and look critically at ourselves here in America and share our narrative or voice in it," Islam said. On Tuesday MSA held a virtual feature of the Muslim World and local Muslim scholar Jalal Abualrub spoke about the myth of radical Islamic terrorism on Wednesday. MSA is holding a world bazaar in the Student Union Lobby on Thursday. Local vendors from different countries will create a colorful array of cultures within the Muslim tradition, Islam said. “We've even incorporated some traditional Muslim foods. It's our third year running and it's always been a pretty big hit among the campus students," she said. Students will be marching for solidarity at 5 p.m. in the Student Union lobby on Friday. Eight clubs will join MSA and stand up against “all forms of bigotry, hatred and discrimination,” Islam said. Senator Tim Kennedy will be attending the march and delivering a speech at the end. Hamza Aamir, a sophomore psychology major, decided to participate in Islamic Awareness Week because he wanted to share his identity as a Muslim with other students. Aamir said the Muslim culture is rich and diverse. He wants to be able to celebrate differences and diversity. Islam said MSA held Islamic Awareness Week early in the semester, so students did not have to struggle to attend once the semester picks up. "I personally like that it pushes us as a club and as a team to work very hard,” she said. “Leading up to the week, we often meet on a daily basis to work things out. However, I don't like how hectic and stressful it becomes when there's an event every single day to prepare for. In the end it's worth it. But it does take a lot of effort. 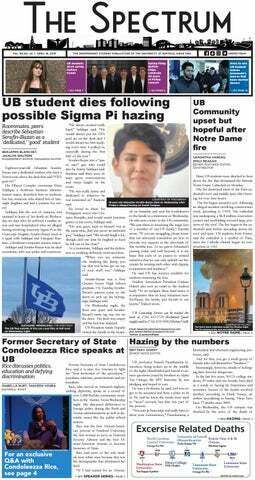 Ema Makas is a news staff writer and can be reached at news@ubspectrum.com.